When you have a baby, every time you see the midwife, they sit you down and ask you a series of questions about your mental health. When my second baby was born I remember thinking about this daily, I wanted to make sure everything I was feeling was “normal”. Every time I saw the midwife I assured her I was fine, this wasn’t my first rodeo. Looking back I still believe this to be true. Fast forward 8 months and something changed. My husband got an amazing job opportunity in another town 3 hours away; we still had a lease on our house for 3 more months where we were currently living. We made the decision that my husband would go and live/work away until we could join him. With my husband only able to drive home every second weekend, I was left with a demanding baby and toddler to fend for myself whilst also working part time. In hindsight, this is where my mental health went downhill. I gradually stopped leaving the house, as it all just felt too hard. When I would speak to my husband on the phone, I was irritable and when he did come home; all I wanted was relief from the children, not to actually see him. I started to resent him for something that we both decided to do. I was really struggling with the day to day challenges of raising two small children on my own while my husband was away living the bachelor life. At the time I didn’t realise, but I was spiralling. Eight months after we moved and joined my husband something happened that was the turning point in my journey. One day my 18 month old dropped food on the floor, a regular occurrence, and I completely lost my mind over it. There was yelling, there was crying, it wasn’t pretty. After I had calmed down I realised, this isn’t me, what have I become!? By that point, I didn’t want to get out of bed in the morning, I was always tired, I was always snapping at my kids, I wouldn’t speak in social settings, I had totally withdrawn from my life, and my husband. This was the day I realised, I was depressed, and I had been for a long time. I sat down with my husband that night and explained to him how I was feeling. He was confused and didn’t understand what I was going through, and to be totally honest, I didn’t either. He reluctantly agreed to take the kids away to visit his family, which gave me some long overdue alone time. I spent the next two days talking things out with my mum and my sister, the two people closest to me, only to come to the realisation that I was miserable within myself, but also within my relationship. Things had been bad for so long at that point, I knew my relationship was over. I made the extremely difficult decision to end my marriage after 10 years together and focus on myself and my own happiness. The first thing I did was to go and see a doctor; the doctor referred me to a psychologist and said I would get 10 free sessions if I chose to book in. I left with my referral in hand, but never actually called to book the appointment. At that point I tipped the scales at 93kg. As a newly single, stay at home mum, there were so many things working against me but I had a new perspective. I wanted to change my life, I wanted to be happy and I was 100% committed. The second thing I did was completely change my diet. You don’t get to be 93kgs without having some extremely bad habits to break, this was instrumental in my weight loss. I cut out ALL junk food, ALL drinks except water, I started eating a lot of protein, fruit and vegetables and reduced my carb intake. I then made sure I got out for a walk every day with the kids in the pram. Walking was a way for me to move my body, but also clear my mind. I found that walking did more for my mental health then it did for my physical health. Every day I woke up with purpose, I had set a routine for myself and was sticking to it. After 7 weeks I had lost 10kgs! I was no longer feeling depressed, the changes I was seeing in myself were not just physical, but my mental health had come a long way as well. By focusing on my health and fitness, I was re-discovering who I was and I was loving every minute of it. At this point my kids were getting fed up with sitting in the pram every day and my walks were becoming less enjoyable. I decided it was time to join a gym that had a crèche. It was the best of both worlds, the boys would have a great time playing with other kids and I got some ME time to workout in peace. Our routine changed slightly but I was more determined then ever. Fast forward another 4 months and I had lost 20kgs in total! I had surpassed my first goal weight and was feeling amazing! After years of tormenting my body, gaining and loosing weight, by this point, with such a dramatic weight loss, a new issue arose. I was finding there were parts of my body that I didn’t like and no matter what I did I couldn’t change them. My breasts and tummy were my biggest problem areas, they were the things I couldn’t see past, and the things causing me a lot of back pain. This pain was really starting to affect my mental health and despite trying to accept my body the way it was, I just wasn’t happy when I looked in the mirror. At that point, after a lot of consideration, I decided I was going to go under the knife. I booked in for a tummy tuck with muscle repair and a breast reduction. There were a lot of things to consider, but the biggest being, I knew once I did this, there would be no more babies. Surgery is expensive and I did not want to spend the money only to ruin the results having another baby. I was confident my baby factory was closed and booked a date. Not long after I made this decision, my husband and I started dating again. My husband went through quite a transformation of his own and has now lost approximately 50kgs! He was a new man and all of a sudden we had common ground, we had the same positive attitude, and over time, love blossomed(again). I honestly still pinch myself that this is our life now! We live and breath an active healthy lifestyle and I cannot tell you how different we live now compared to two years ago! Tom was very supportive through my surgery and recovery and although he loved me the way I was, he was happy that I was happy. Fast-forward a year and I am still on my weight loss journey, I have surpassed not one, but two weight loss goals and am the happiest, fittest and healthiest I have ever been. At the beginning of my weight loss journey I wasn’t the heaviest I had ever been but I weighed in at 93kgs, and was a tight size 16 (AUS). I am now 64kgs and a comfortable size 10! Right around the time Tom and I started dating I got a new job. I currently work in an office full time and still get to the gym 6 days a week! Life is a juggling act right now but the old saying rings true here, you make time for things important to you. For me, my number one priority is my health and fitness. I will never go back to that overweight woman who was always angry and had no energy. I want to set a positive example for my children and teach them about health and nutrition so they never face the struggles we went through. I also want to help other women achieve this, to let them know that long term weight loss IS possible no matter what their circumstances. I have recently started my Cert 3 & 4 in fitness to become a personal trainer and can’t wait to continue to make a difference in peoples lives. I want to reach as many people as possible and spread the message, life is too short to waste it being unhappy, and only YOU have the power to change it. If you are burning more calories then you are consuming, this is called a calorie deficit. You need to be in a calorie deficit to loose fat. My favourite way of monitoring this is using my Fitbit Versa to get an idea of calories burned and then the My Fitness Pal app to track my food intake. Use a BMR calculator to calculate your daily energy requirements and how much you should be eating for weight loss; this takes into account your physical activity levels. Never start your weight loss journey with the idea in your head that you want FAST weight loss. Quick fixes don’t work long term. Slow weight loss is more maintainable and a much healthier approach. (Note: If you have a lot of weight to lose like I did, once you make the changes required to improve your lifestyle you may notice that you drop weight quickly initially, this is ok! Again on the subject of food, AVOID FAD DIETS. You should be eating a healthy balance of food, and if you are tracking your calories in an app like suggested, you will quickly learn appropriate portion sizes and how to get more bang for your buck when it comes to food. Incorporate a mix of fruit, veges, protein, complex carbs and healthy fats. Do some research, try new things! Move your body! Find a form of physical activity you enjoy and do that! Remember, I started out just walking, and I still love going for walks now. You don’t have to be in the gym every day (this is just my preferred method of physical activity). My daily walks not only helped me drop KGS in the beginning, it also played a part in drastically improving my mental health. There are so many benefits to regular exercise, I highly recommend it! Lastly, set a realistic goal for yourself! When you have something to work towards, this keeps you focused and motivated. 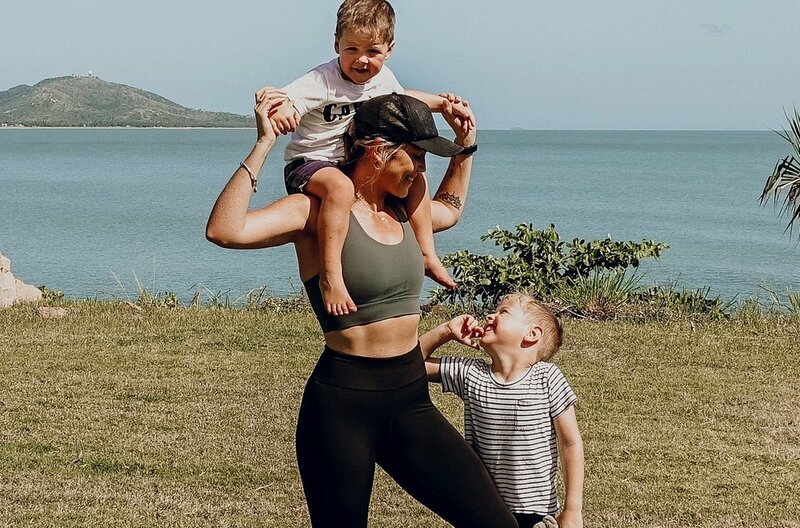 Alex Nisbet is 29, a wife and mum to two little boys and after being overweight her entire adult life is now sharing her inspiring story in the hopes that it will motivate others to make changes in their own lives. You can follow her @alexsfitlife_ on Instagram where she helps to motivate, inspire and educate her community.